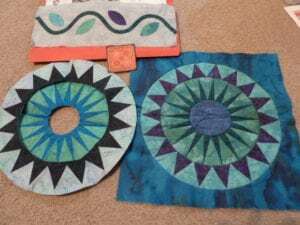 UFOs – or in quilting language, the “unfinished object”. I have done a bit of a re-organisation and stock take of what is actually in my sewing room recently and the actual number of UFOs is not going to be published, suffice to say it is rather high. How long some of them have been there is another source of embarrassment. However I have decided that I no longer want to finish all of them. Some of them were started in classes and not finished. I still count these as worth having started though because I have learnt the technique at the class and have since used many of these techniques in other work. That doesn’t mean I have to invest more time to finish them though. After all we only have limited time to do the things we love! These flowers were started in a class with Mary Transom. I do still love them enough to want to use them, but not necessarily in the pattern they are meant for. I have already used Mary’s technique in another wall hanging I made of a vase of flowers. These may end up being combined with something else. 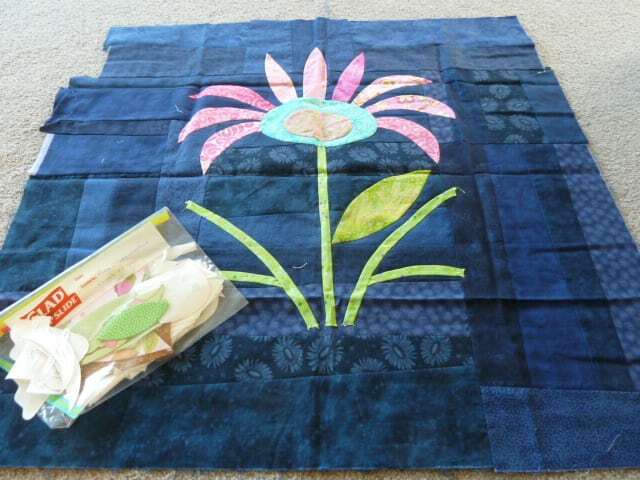 This “quilt” was started in a class with Katrina Harjimichael at a Symposium – Palmerston North I think. I still love the colours, and the intricate piecing is something I like doing, but this is supposed to be a full sized quilt. I don’t think I need to make hundreds of blocks to get the techniques down pat so this is going to be downsized – perhaps to a table runner with three blocks? Don’t be afraid to change the original intent and size in order to get a UFO finished. 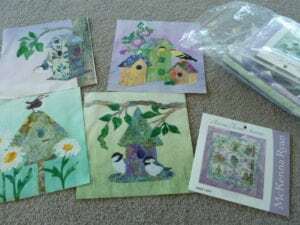 I have a few McKenna Ryan wall hangings partly done. Luckily these have been put away with all the necessary fabrics and now just require some time put in to them. It is a good idea to pack everything for a project up together if you can’t finish it straight away. But sometimes one of the reasons projects become UFOs is because we have a hiccup along the way. We may be short of a fabric (I think this often ends up in a more creative result) or we may need to do a little unpicking! Sometimes we just don’t know what to do next! If you are in the ‘stumped’ space don’t be afraid to ask for help. Ladies at your local quilt group will have suggestions and I am more than happy to help you draw up a plan if you come and see me at The Quilting Shed. Bring all your left over fabrics from the project with you as well as anything else you already have that may work so we can try and utilize those in finishing your project. Others I look at and think “what was I thinking” when I look at my choice of fabrics. My tastes have changed and it would now be a chore rather than pleasure to finish. For example there is a bit of Debbie Mumm in there (I did like it once, honestly) and I would much rather work with Kaffe or Tula Pink now! These will probably be donated to a good cause and then I won’t need to feel guilty about not finishing them anymore. So I suggest you have a good look at your UFOs and ask yourself some questions. Do I still love this and want to invest my time in finishing it? Do I have everything I need to finish it? If not, where can I get it from? Can I finish it but make a smaller version? Or combine it with something else and finish two or more things at once? Do I need to ask for some help or advice and who will I ask? If I decide not to finish it, what will I do with it? Donate to a group to finish and use for charity? Sell partly done on the likes of Trade Me? Donate to a good cause?- our local Altrusa has a fabric bizarre once a year and use the profits for good causes. Do you have lots of UFOs and if you do, what ideas do you have to reduce your UFOs and bring them back to a more manageable level? Or do you have some ideas on how not to end up with UFOs in the first place? I wouldn’t like to count up my UFOS. I did several years ago & some of these have been finished but many more have been added to the list so the number is probably about the same or more!! Time & the determination to stick to one project at a time is what I need. At club the other night our theme for the month was circles. It caused a laugh when the label on my quilt was read out – Begun in Harriet Hargrave’s class at Nelson Symposium in May 1995. Finally finished at 5.30 p.m. 9 February 2011. So there is hope for all the others on my UFO list. Goes to show if you still love a UFO it is worth keeping it! Some very sound advice there. Thanks for sharing Cathy – it’s a great site. I loved the precut fabrics eg: Hummingbird if you like the blue hues. I’m working on my list of UFOs. Since my last comment I have given away one project that I couldn’t see me finishing & have dug out another that had all the blocks made and just needs to be put together. Have made some progress on it. Just have to keep thinking of this quote that I have on my fridge ‘If it is to be it is up to me’. I like the idea of re-purposing a UFO if it means getting it out of the pile. 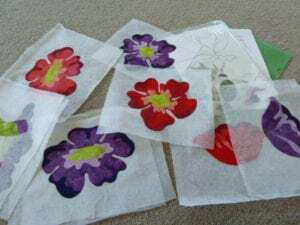 I have a couple of flower projects from workshops which may find their way into a couple of bags instead of wall hangings. Perhaps!! !